I see dead animals … or do I? 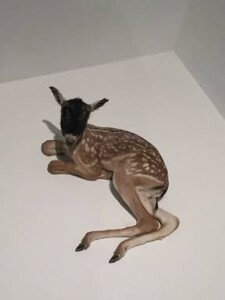 Dead Animals or The Curious Occurrence of Taxidermy Contemporary Art at the David Winton Bell Gallery in Providence will have you either seeing art or exploited art. 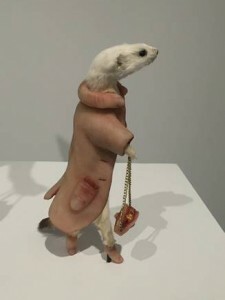 The show focuses on four basic views of taxidermy by contemporary artists: dead animals, hybrid-creativity, human or non-human and museum photographs. I was intrigued by all four. 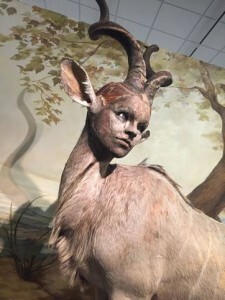 Curious about taxidermy, I looked up the definition: From the Greek language; the art of stuffing and mounting animal skins for purpose of display and/or study. Hmmm … noteworthy. Walking into the exhibit entrance, you are greeted with ‘behind-the-scenes’ photographs of museum prop work. What an interesting perspective of the ‘to’ and ‘fro’ of animal placement in dioramas and wild life species. Like another day at the office in the museum world, the angle of animal placement is extremely creative and well-thought-out. I liked what I saw immediately. Heading into the main gallery, with disturbance disclaimer featured, I was mind-silenced with the presence of the natural world. 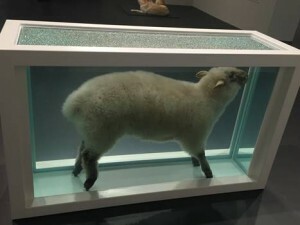 Artist Damien Hurst followed his expression with a lamb encased in formaldehyde solution. What a unique technique and visual perspective! A different take is Thomas Grunfeld’s creation of goat/fawn. Thomas’ version is in reference to breeding and the seamlessly joined species. It does make you think — what would other animals look like with mixed reproduction? Moving along and around the gallery I stood and stared at Deborah Sengl’s interpretation of human, non-human ‘Killed to be Dressed.’ The reversal of using human elements to adorn wildlife has one imagining the vain in our society. Perhaps this is where conversations may come up around the whole ‘animal fur’ topic. Fascinating and chilling in the same thought. I was equally captivated with Nicholas Galanin’s wolf pelts and felt. The pelt of the lower body of the wolf was displayed on the floor to resemble an aristocratic throw with the upper portion intact and stuffed. Does this play on the back and forth of life and death? Some may interpret it as a struggle with trappers and hunting while others may see the artistic view as a creative play on taxidermy and pure sculpture. There could be many translations here. One of the most powerful pieces is Kate Clark’s ‘Licking the Plate.’ With full spotlight on the sculpture of human and animal commonality, some may view this as unsettling while trying to figure out the human aspect placed on animal figure. Are humans any different than animals? Is there a common thread that keeps us close, but somehow we are separated? The use of materials is lifelike and tailored. The colors are subdued and the action is quite somber. View this from many angles and your interpretation may change. 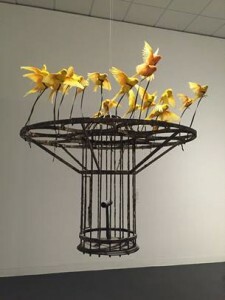 One of the last colorful pieces by Polly Morgan is her ‘Systemic Inflammation.’ Yellow finches in flight around a bird cage draws on the oxymoron of freedom, space and captivity. A reversal of pretty birds in a coop, but unrestricted. The taxidermy portion has me thinking of a new and welcoming definition toward the animal kingdom. I would recommend this exhibit if inquisitive about taxidermy and how different perspectives of art are put together and presented. Previous post: Advice from the Trenches: Jealousy!